The annual 17th Police District Advisory Council Banquet is coming up on Saturday, May 19th at 7pm! The banquet supports programming for the district, which includes the Blue Ribbon Awards, honoring officers each month who have meade steller contributions to the community. The PDAC also provides annual scholarships for local teens, hosts community block parties, and feeds officers and those in need during the holidays. The banquet will include dinner, an open bar, and entertainment from local artists. It's a great time and supports a great cause! Learn 3 simple steps that anyone can use to help prevent suicide. You will learn how to identify risk factors, recognize the warning signs of a suicide crisis and how to question, persuade, and refer someone to help. Join the 17th Police District Advisory Council (PDAC) on Monday, October 30th, 2017 at the South Philadelphia branch of the Free Library from 5:30pm to 7:45pm. The 17th District Police District Advisory Council (PDAC) is hosting a fundraising banquet tonight, May 10th, 2017 that is sure to be a fun time supporting a great cause! The 17th Police District Advisory Council hosts several programs for the communities of Point Breeze, Grays Ferry, and Southwest Center City. The PDAC provides annual scholarships for local teens, hosts community block parties, feeds officers and those in need during the holidays, and honors officers who have made contributions to the community. Tickets are $75, which includes an open bar, dinner (including stuffed flounder, chicken marsala, roast beef, and more), DJ, dancing, auctions, and raffles. It’s sure to be a blast! We welcome all our neighbors to buy a ticket, invite your friends, and come out to celebrate the night! The 17th District Police District Advisory Council (PDAC) is hosting a fundraising banquet on May10th, 2017 that is sure to be a fun time supporting a great cause! The 17th Police District Advisory Council hosts several programs for the communities of Point Breeze, Grays Ferry, and Southwest Center City. These programs include the Blue Ribbon Awards Program which honors officers each month who have made stellar contributions to the community. The PDAC also provides annual scholarships for local teens, hosts community block parties, and feeds officers and those in need during the holidays. The annual banquet will be a fundraiser to ensure continued support of the PDAC programs to all of us in the community. This year’s banquet is a formal dinner with dancing and DJ throughout the night. It’s sure to be a blast! We welcome all our neighbors to buy a ticket, invite your friends, and come out to celebrate the night! Last month was so busy that we had to take a month off from newsletter-writing to fit everything in, but we're back and have lots to report! This includes a very important upcoming vote (see more below) that could have a big impact on our organization. 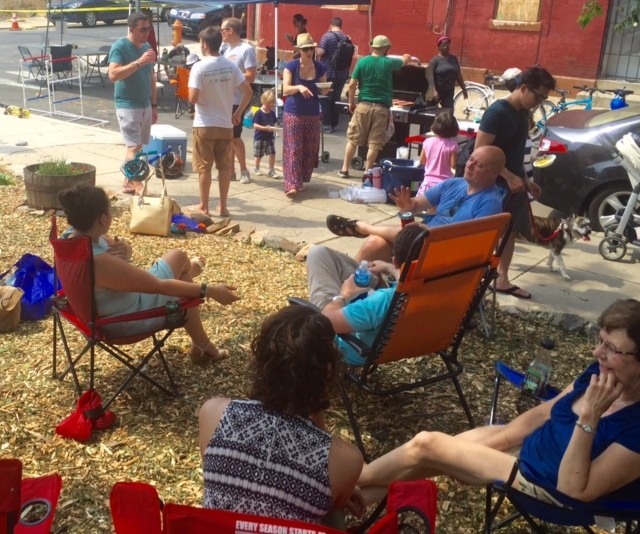 So enough with the introduction - just keep scrolling to find out about how to get involved, neighborhood happenings, and what NNA is up to! We're proud of our neighborhood, especially its rich history and diversity, which is why the NNA board has agreed to hold a vote at our monthly general meeting in July on whether we should change our name. We know that the name "Newbold" comes with a lot of mixed feelings, which is why we think it's worth considering a new name that ensures our non-profit sincerely and purposefully represents all of our neighbors, new and old. We are announcing the vote today, which will be held on Wednesday, July 27th at our regular general meeting (6:30pm at Reed Street Apartments). If we vote to retain the name, then that's the end of the issue for now. However if we vote to change the name, then we will start asking for proposals for a new name, and the most popular suggestions will be held for a vote at our August general meeting. Do you have strong feelings about this issue? Then please come out and voice them, we want to hear your take! We truly want to ensure this process is as transparent and open as possible, so please reach out with any questions to president@newboldneighbors.org. On Saturday, June 11, the Clean and Green committee hosted a clean up and neighborhood picnic at Manton Green. Thank you so much to all the neighbors who helped make the event a success! It was great to see so many of you. If you haven't already, check out the new planters and vegetable garden at the Green (17th and Manton). It's looking spectacular! Wanted: Clean & Green Committee Members! Mark your calendars for the next committee meeting on Thursday, July 14th at 6:30 PM (location TBD). We will be discussing upcoming events, such as the Philadelphia Water Department's Rain Check program workshop we are looking to plan for the end of August. Please email clean@newboldneighbors.org from more info. Hope to see you there! 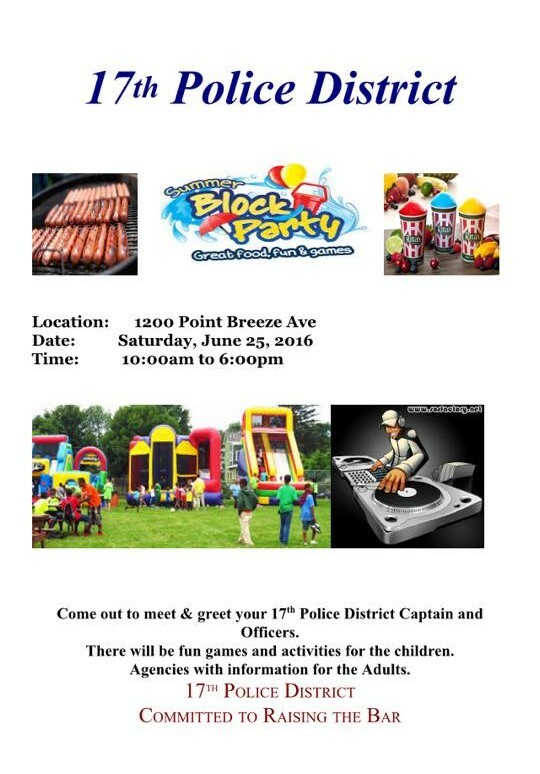 The 17th District of the Philadelphia police are throwing their annual block party on June 25th from 10am to 6pm. They'll have tons of kid friendly activities, food and members of the PA Army National Guard's 103rd Engineer Battalion will be showing kids a military vehicle and equipment. Email Charlie Elison if your organization is interested in setting up a table or if you'd like to help a few neighbors run children's activities. Public Safety reminds you that you can always join us at the PSA Meetings, Captain's Meetings, Neighborhood Walk or feel free to email us with questions and concerns. We'd love to see you there. Check the NNA calendar for more details and keep up with all the great things our committees are doing. A little prevention goes a long way. Lock your doors and windows and remember to remove valuables from your car. Be aware when using your cell phone as you walk, especially at night. Making sure your outdoor lights are operational and turned on as the sun sets helps a would-be criminal think twice and consider moving-on to less visible targets. Lastly, If you would like to meet the local officers and leaders of the PSAs, please stop by 1200 Block of Point Breeze Avenue on Saturday June 25th, 10am to 6pm where the 17th District will be holding a meet and greet. Have a great month and stay safe. It's that time of year again for the annual NNA elections! We currently have four nominations for the board. Come out and vote at our general meeting on February 23rd, 2016. If you would like to nominate someone, please e-mail president@newboldneighbors.org. We will also be presenting a set of proposed amendments to the by-laws, which we will be voting on at our March General Meeting (3/22/16).